The “Springs Fire” of the last few weeks destroyed the vegetation of a large swath of the Santa Monica Mountains (along with a few buildings and RVs). 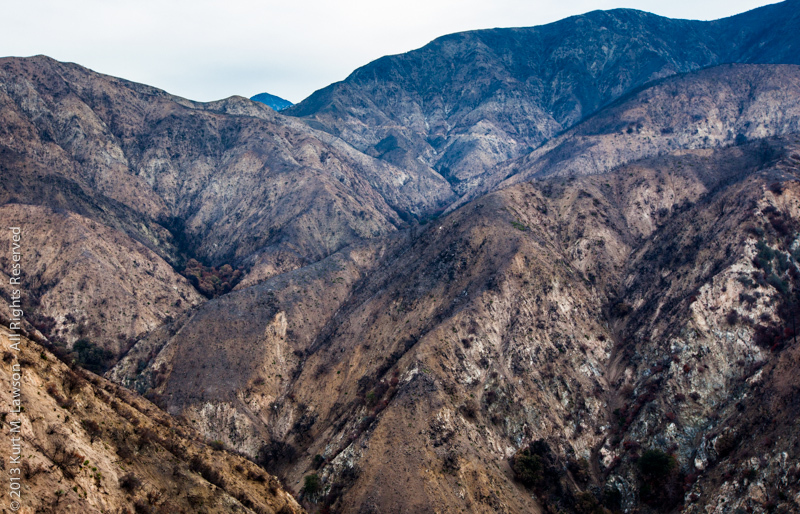 Thinking about how this area will recover inspired me to go and check on how another burned area is recovering, 3.5 years since the devastating “Station Fire” swept through the San Gabriel Mountains. I had visited the area on the weekend the Angeles Crest Highway re-opened (which would close again about a week later when rain sent landslides through). When I visited these burned out hills, it had already been a couple of months since the fires and green was already starting to emerge. What would the landscape look like now, in May 2013, compared to December 2009 when I was last here? I had not been back to the area since that trip. I’m still sad about the loss of Colby Canyon and Strawberry Peak trails in particular. You can see my surreal pics from the Station Fire itself, which were the first pics posted in this photography blog here here and here. Much of the area shown in these pictures is contained in the Station Fire Recovery Area. You can see a map of the area here: http://maps.fs.fed.us/stationfire/. All of my photos were taken from turnouts on the side of the highway. Green has returned! 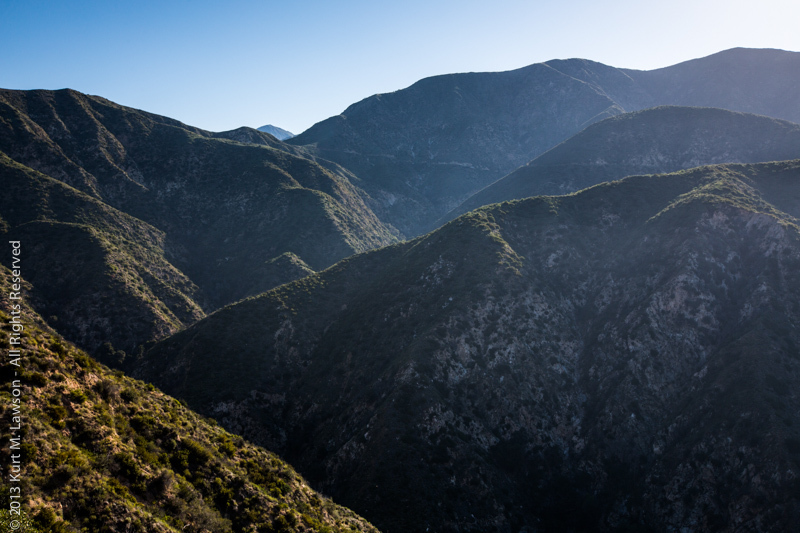 That was immediately evident as I first began my slow drive up the Angeles Crest Highway. Gone are the browns and greys. Young green has returned to the hillsides that were bare. At the bottom of the second picture you can see another thing that was very evident: trash. The fire burned away all the trash, but it seems careless people just can’t help themselves, and trash was evident roadside wherever I stopped. Sad. The trees are gone and the drainage along the roadside has been completely reworked. I would guess there were debris flow problems here in the floods after the fire. These next few photos are approximate but from the same turnout. I couldn’t figure out exactly where I had pointed the camera before. Even with GPS coordinates it wasn’t too obvious. As you can see it’s a pretty dramatic difference, even in the little areas. These wider views show the dramatic transformation. I could have framed up the view exactly the same, but I opted to keep my own shadow out of the shot. The plants are mostly small compared to what they once were. 3.5 years isn’t long enough to get large growth out of these areas yet. It had been some 60 years since the last time fire had swept through the area. And finally we get to one large burned tree from the Station Fire that is still standing. While there is a lot of recovery that has already happened, it’s clear there is a long ways yet to go. Some of the trails it seems will remain closed for some time. Some trails may be permanently lost. The regrowth of course doesn’t respect old trails, and rockslides have obliterated parts of trails. Essentially what I gathered is that the trails have to in essence be rebuilt, and that is still going to take some time. Modern Hiker just posted about efforts to work on the Strawberry Peak Trail. I hope in a year maybe the trail might re-open, though the views will be a bit different. Other trails might not be so lucky. I hope to one day hike Colby Canyon again. The high point in the picture is Strawberry Peak. This last image finally is a view from the Red Box Picnic Area. Wildflowers are blooming and you can see old growth unburned on the right, saved surely as part of the efforts to fend off the fire on Mt. Wilson. I look at this area and see a little glimpse into the future for the areas like Pt. 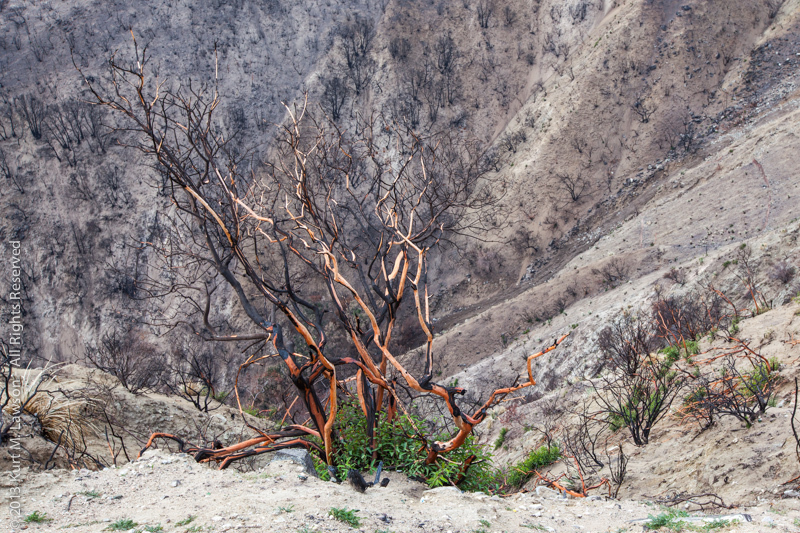 Mugu State Park that recently burned. Those areas are more accessible, and perhaps it will be interesting to follow the recovery there more closely.